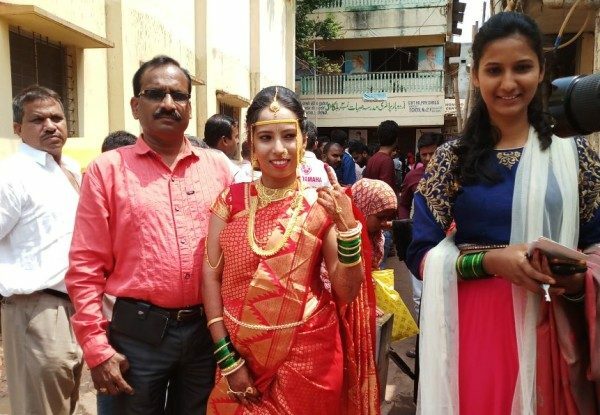 Marriage is a special event in anyone’s life and when it falls on the same day as voting, this couple decided to Vote first and then tie the nuptial knot. Manini Tahshildar and Yash Hande are to get married today but, both first voted at their respective booths and then joined the celebration at the marriage hall. May the Lord shower his choicest blessings on the newly wedded couple. God bless the couple! Their commitment to participate in this democratic process is indeed commendable. its Nice to be a responsible citizen !!!! Hope the elected people show the same commitment.